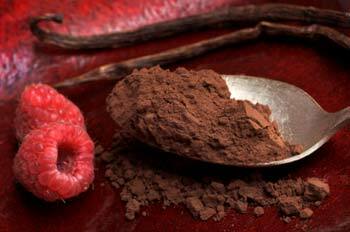 There are two types of unsweetened cocoa used in various chocolate recipes: Natural Cocoa and Dutch Processed Cocoa. Natural Cocoa is made from ground roasted cocoa nibs from which most of the cocoa butter has been extracted. It is naturally acidic with a pH of about 5.4 and is beige in color. Dutch Processed Cocoa is further treated with an alkalizing agent to neutralize its acidity and bring the pH to about 7 and has a rich, dark brown color. Most American cocoas are natural and most European cocoas are Dutch Processed. Many "baking experts" and cookbooks report that it's important to use the type of cocoa specified in a recipe in order for baked goods to rise properly, and that Dutch Cocoa and Natural Cocoa cannot be used interchangeably. But is it really necessary for the home cook to stock both kinds of Cocoa Powder in his/her pantry? Since I wasn't sure of the answer and have gone back and forth in my own baking, I decided to do a little research and turned to the experts I rely on for lots of my cooking and baking questions, the folks at Cook's Illustrated , one of my favorite cooking magazines. Back in 2005, the folks at Cook's Illustrated tested five Dutch Processed Cocoas and five Natural Cocoas in hot chocolate and chocolate shortbread. The top two scoring Dutch Processed and Natural Cocoas were then compared in tests of hot chocolate, shortbread, low-fat chocolate pudding, devil's food cake, and chocolate pudding cake. Their tests revealed no discernible difference in leavening results and the two Dutch Process Cocoas beat out the two Natural Cocoas in terms of both flavor and texture. Dutch Process Cocoa won every test! I don't know about you, but that's sufficient evidence for me to stock only Dutch Process Cocoa in my baking cupboard. Dutch Process Cocoa brands that Cook's Illustrated recommends include Callebaut Dutch Process Baking Cocoa , Droste Cocoa , and Mercken's. I've also had success using Hershey's Dutch Process Cocoa Powder, when that's all I could find on my grocery store's shelves.